I had a teacher, @stephaniem2012, approach me last week about an idea she had for blogging with her 2nd grade students. She felt her kids were not getting as much out of their reading as they could. It was time to find a way to get them motivated to give their best effort when it came to breaking down their books. 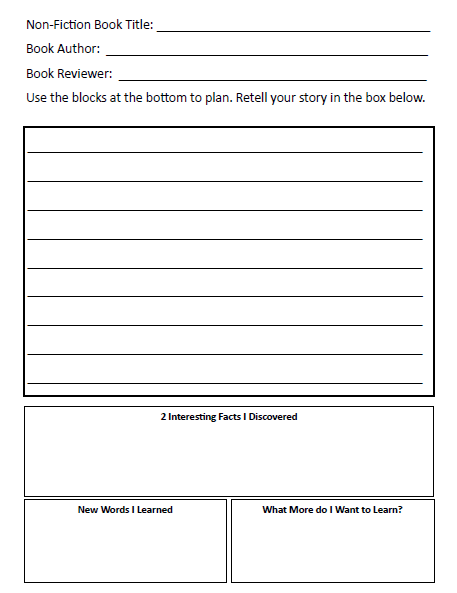 A new approach to book reports was needed, and she felt blogging could be the key. We sat down for a bit and we talked about what she had in mind. She felt her kids would be more excited if they knew there was a chance their product would be posted to a class blog. She wanted them to start blogging about the books they were reading. While I agreed it was a good start, I felt that once the initial “newness” wore off it would lose its effectiveness I remember book reports. I remember how much I hated doing them because I was doing the same thing over and over again. I offered a suggestion of creating a menu for students to choose from. While they are still reporting on what they are reading, this would allow them different platforms to create with. It would also force them to look at their readings from different perspectives. From that the book review blackouts were born. Keep in mind that this started with blogging in mind, but any of this could be used as a station activity or any time with the entire class. The blog serves as a platform to publish the products, but you can do any of this without a blog. We pulled @jwagner_wagner into the mix. She has a lot of great ideas and we knew she could contribute. After some great discussion, a menu for non-fiction, and one for fiction, were born. Each menu has 8 different options for the students to choose from to report on their books. Once they choose an option they are not allowed to choose it again until all options have been completed. The only exception to this is the middle block. 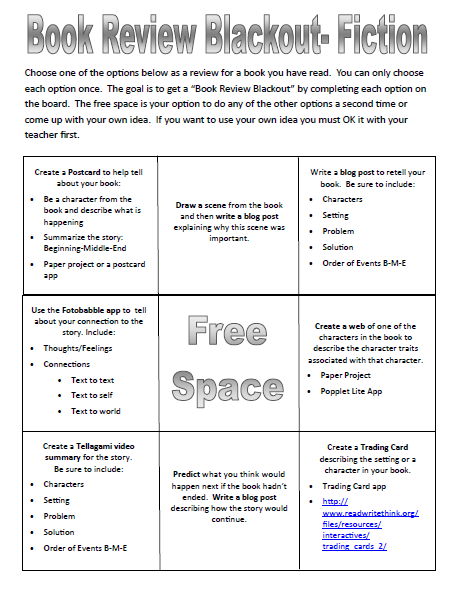 The middle block is a “Free Space” where they can choose to do one of the other options again or come up with something on their own as long as it is approved by the teacher. This gives students some choices as to how they want to deliver their thoughts to an audience. A copy of the menus will be placed in their reading or writing journal. This will help them keep track of what they have done. We tried to incorporate different media into the menus. There are options to create videos, blog posts, graphic organizers, audio clips, postcards, and more. Most options can be done with paper and pencil or with technology. There are a few that are solely tech driven however. 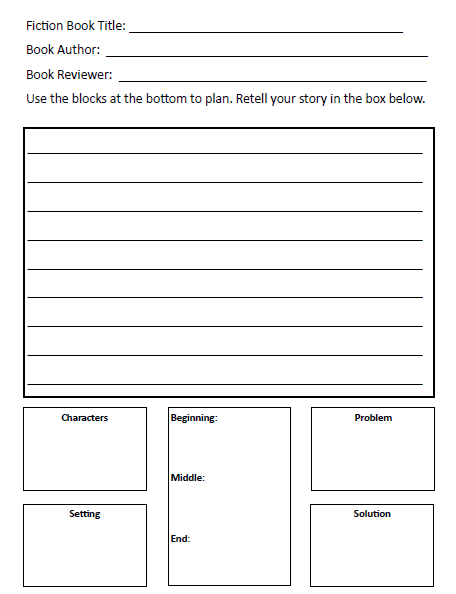 When a student chooses to write a blog post, they will be given a template to help them organize their thoughts and write a draft. The draft can then be revised and edited in preparation to post to the class blog. While this was created with 2nd grade in mind, it would not take much to adapt the idea to any age. Below you will find PDF files of the 2 different menus as well as blog post templates for both fiction and non-fiction. 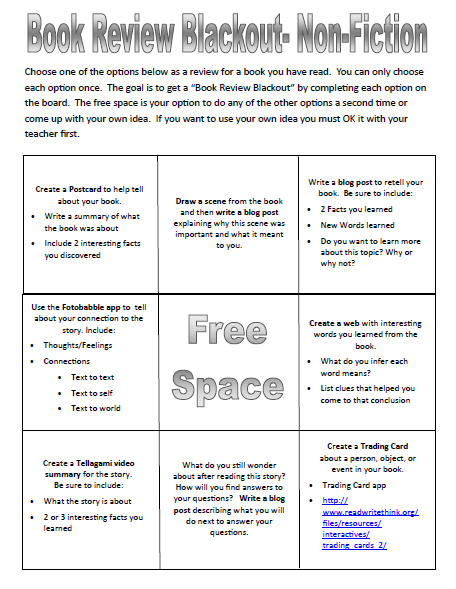 Feel free to use them as they are or just as a starting point to fit the needs of your students. If you have any other great ideas for this activity or blogging in general, please comment on this post. If you are unsure of blogging and how it fits into your classroom, check my archives for 3 blog posts I did at the end of September/beginning of October talking about why, how, and where students should be blogging.